It was in March 2017 that I first mentioned an intention to start a 1066 figure project for a Hastings game, fully expecting it to be up and running by now. This was to be a ‘from scratch’ project, but to date there has been too much thinking and not enough painting, so it becomes the main project for 2018 and is now getting the sort of attention needed if a game is to hit the table. As things get jacked up to make a more determined approach, this post takes a look at the basic plans of getting this game together, including discussion on the army structures and the needed terrain. So here begins the gentle ramblings, direction, misdirection and re-direction of a project manager, designer, recruiter, painter and modeller - ah yes, the simple wargamer! I have been meaning to do Hastings 1066 as a figure project for a while. It is just one of those battles that holds my imagination and from the perspective of the history of these isles, it remains a significant moment. The basic premise of the project will be that the game will fit into a 4’ x 3’ space and use Kallistra’s 4” hexes on a grid size with the sort of scope that would be familiar to Command and Colors players. The two armies will be built from scratch using Kallistra’s 12mm 1066 range. These are sold in blisters of 32 infantry and 16 cavalry and at the time of writing, are priced so that for every 5 blisters bought, a 6th will be provided free. To reconsolidate some familiarity with the subject, I have started reading Harold, The King Who Fell at Hastings by Peter Rex. The book is unsurprisingly Harold centric, or rather Anglo Saxon / Danish focused and I am enjoying the immersion in the dynastic history that framed this conflict. The scenario - This is to be tightly focused on the Battle of Hastings 1066 as we traditionally understand it, with the two armies already arrayed in their historical positions. We see Harold’s army covering the full frontage of Senlac Ridge slope. He has his Housecarls in the front line supported by Thegns. To their rear the General Fyrd are formed up. The two flanks of the ridge are protected by boggy ground. William matches this frontage with his army divided by three national groups. On the left are the Bretons, he takes the centre with the Normans (the largest force) and on the right we have the Franco-Flemish. This was a notably long battle for the age, lasting eight hours rather than being a typical two hour affair and throughout that time, William was forced into continuing his frontal assault, suggesting that the boggy flanks to the ridge could not be exploited. Consequently, we will close our battlefield down, so that likewise, our Norman player is compelled to make that grinding frontal assault. We will make the battlefield just 12 hexes wide, with the ridge frontage occupying 9 hexes and flanked by soft marshy ground. I currently have a boardgame on the subject in print, together with a sister game covering Stamford Bridge and being hexed games, they have become my starting point for laying out the scenario and thinking about rules. Armies - Above is a shot of the start up positions of both forces in my boardgame. The Anglo - Saxons are divided by warrior class. The front line of units are representing Thegns, people of some rank and privilege, who are efficient fighters. But the unit counters represent more than just the Thegns, they also represent the very front rank of the Thegn body being hardened by the Housecarls, which can be thought of as professional soldiery, they are armoured and determined fighters. A separate detachment of Housecarls also serve as a bodyguard to the King. They will and did die for him. To their rear, the lines are composed of the General Fyrd. They are are generally a farmer class and can be regarded as being obliged to the Thegns. The Thegns were obligated to bring to battle one farmer for every five hides (portions of farming land) that the Thegn controlled. They are not as well armed / armoured or as militaristic as the Thegns. Amongst their ranks, there were some skirmishing missile troops, but archers were not formed as a definitive separate commanded arm to the army. William’s army was divided in the first instance by nationality. On the left flank sit the Bretons, to the centre and by far the largest contingent, the Normans and on the right flank, the Franco-Flemish (as shown by the red bars above). Across this entire force, the battle lines were drawn up in equal tactical fashion (as shown by the blue bars above). To the front are archers, generally using the shortbow and some crossbow. Next are the infantry. Except for the Bretons, these can be classed as spear (and sword) armed heavy infantry. Finally in the rear are the heavy cavalry. The Norman army had a significant cavalry arm, though at Hastings, the terrain severely limited their function. It is thought that they had not yet developed the full charge tactic with lance / spear couched under-arm, rather they approached the enemy with their spear over-arm. They were armoured and skilled fighters. The Breton contingent had a greater proportion of lighter infantry and cavalry types amongst their ranks. Terrain - In recent years, there have been some attempts at re-interpreting the location of the battlefield. I am content to go with the ‘traditional’ site. In the resource section at the foot of this post, there is a link to a short article that I posted some time ago concerning the likely site of the battle, though in truth, if we accept the general account of battle, all we really need is a ridge with difficult terrain to its flanks and a small hillock on the Norman left, regardless of where that may have actually been! Our tight focus on this battlefield gives us exactly that. The above graphic shows the main elements of the battlefield that I will use to create the tabletop version. I want to represent Asten Brook (with its causeway gap), but have had to bring it back to the Norman player table edge so as not to over extend the usable depth of the battlefield and compromise our ability to squeeze all of this battlefield into our gaming space. For the same reasons, the associated adjacent boggy ground along its length has been brought into the brook hex itself, to be integral with that feature. Anything entering the brook will become disordered. The flanks of the ridge will have boggy ground and likewise, entering it will disorder units. Disordering in the boardgame puts units at a significant disadvantage, plus they cannot attack. The two effects of this soft ground are that, firstly and importantly, the Norman player will find it very difficult to exploit the flanks of the ridge and secondly, if Harold is able to launch a large successful counter-attack, the Norman army will find itself disadvantaged when pressed against Asten Brook. 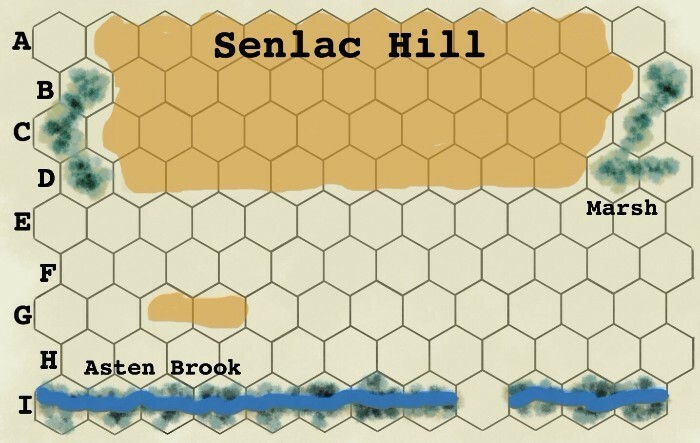 The most important feature, Senlac Ridge itself, is constructed using the Kallistra level 2 slope hexes, so that the contour can be properly represented as a single feature across the table, rather than relying on a series of individual pre-formed hills to get the same effect. The small hillock to the rear of the Bretons position is represented by a 2 hex linear pre-formed hill. Unfortunately, I can never get slopes and rises to photograph well with this terrain, as the high ground textures match the board and overhead light tends to blow out the slope effect, however, to the naked eye they are easily identifiable and look good. There is a trackway that runs from baseline to baseline via the gap (causeway) at Asten Brook, but I have decided to leave this off our map as it does not serve a tactical purpose for our game nor indeed did it in the battle itself. I did include it on the boardgame version of the map, but as the design notes said, that was for aesthetic reasons only. block as I still need to varnish it. Above - To extend my collection of marshy ground, I have knocked up a couple of these resin marsh features. They are slightly larger than the hex, so help break up the hex pattern. Interestingly I had left some clump grasses on a window ledge for a few months and the tips became heavily faded by the sun, but they look just right in this marsh terrain piece. Most of terrain needed is pretty much game ready or at least in hand, so I am happy for the terrain list to be ticked as ‘done’, with just minor bits of dressing to be added. At some future point, I would be happy to extend the width of the table so that Senlac Ridge can be longer, but that requires more space and more figures than initially underpins this project. Figures - Kallistra sell their 12mm figures in blister packs that allow the creation of 4 of their supplied bases (40mm x 20mm), each double ranked with 8 figures, so you get 32 infantry figures per blister pack or 16 cavalry. I had thought that I had around two thirds of the forces needed in the lead pile, but a change in basing decision means that I have a little less than that, but there is little point in buying the rest just yet, as I get over-faced if I have too much unpainted lead. Painting - To give this project the kick-start it needs, More time has had to be diverted to it and so I am cutting back on what I feel has become excessive daily internet browsing time and this is liberating around 45 minutes to an hour each day. The project requires almost 1000 figures (counting cavalry as 2 figures) on just over large 50 bases, so this really needs a speed painting approach, a sort of ‘paint the unit and not the figure’ ethos - easier said than done I think, but I need to embrace a step down in detail as a basic practicality. Recently I have been getting through two units a week from priming to basing. At that rate this would be a 6 month project and whilst I would like to get that time-frame down, experience tells me that in truth this could well be closer to a 9 month project and so it becomes ‘the’ project for 2018. 12mm reminds me of the old, original 15mm scale, so I think this makes speed painting a little harder to achieve than with 10mm or 6mm sizes, without some of the ‘mishaps’ looking more obvious. Digital photography can be unforgiving. As in all things, it will be a case of getting the balance right between speed and accuracy. Basing - This is probably the thing that has had me most stumped and has become a bigger problem than it should have, but I am happy with the final decisions ...... for the moment! In this battle, the Housecarls fought right along the front line, giving a sort of elite / armoured hard edge to the already capable Thegns. In effect this sort of thing is partly reflected in some rules as a ‘combined units’ type option, though a surprising number of commercial army lists don’t do this and have the Housecarls and Thegns operating as independent units. Either way, most commercial rules would not provide enough Housecarl units anyway to cover the full frontage of the battle-line. To represent a line complete with both Thegn and Housecarl units would need more figures and then as a consequence, other units on the board for both sides would also have to have some sort of ’doubling up’ per hex to equalise our trickery with the Housecarl / Thegn contingents. If I went with the Kallistra basing system, I would need 2 x 40mm Housecarl bases (16 figures) side by side, with 2 x 40mm bases of Thegn hard up behind them in the same hex, so that 4 bases were forming one unit. One of the things that I feel about the smaller scales is that once you move away from the Horse and Musket period, it can be harder to distinguish between unit and weapon types and so I partly want the way the bases look to help with unit type recognition. Having started with the Kallistra basing system, I decided after 16 small bases were done, that I should rebase to meet my aesthetic goals and also to have 1 base equal 1 unit to significantly ease the amount of figure / base moving that takes place over the course of the game, which has the greater benefit of helping those with back ache! Anyway, I decided to go for single 80mm wide bases (to fit in the 100mm hexes) using a mix of depths of 30mm and 40mm. The heavy infantry would be 3 ranks deep. For my Anglo-Saxons this immediately helped, as I could have two ranks of Thegns, plus a front rank of Housecarls, for that ‘hard edge’ all on the same base. These bases would be 40mm deep. This of course is a very bespoke way to base an army and will not readily suit commercial rules, so basing wise I am in a bit of a one-way street, but since I am supplying both sides, it hardly matters. It will however impact on how I eventually do other armies in the period though, I am thinking here of Viking or Crusader battles. In the Norman army, all the armoured heavy spear would likewise be based in 3 ranks on deep bases and therefore also need the 40mm deep base to represent their heavy status. Above, this was how I was originally basing a unit. Two 40mm bases side by side with two ranks per per base. They do have the advantage that two bases sit on high ground better than a larger single 80mm base, which itself looks odd with one or both end of the base typically hanging in mid-air! Above, The new basing for the Norman heavy spear uses an 80mm wide base by 40mm deep. The figures are in three ranks to represent their status of heavy infantry and the base provides easy recognition of troop type and as a unit is easier to move around. The non-heavy infantry types, such as the General Fyrd (Anglo-Saxon medium or light - medium infantry, depending upon how your rules define them) and light infantry (Bretons), can be represented by just two ranks on 30mm deep bases. Since re-basing, I have had to rebase the General Fyrd again! The problem was that the single 80mm base allows for a more efficient placement of figures than two separate 40mm bases, so sticking with the 8 soldiers per rank, meant that they looked slightly too spread out on the bigger base. Worse, these particular figures are produced in pairs, with one joined behind the other. Since most have a spear being thrust forwards, to my eyes, this spacing and the closeness of the second rank, made them look rather too much like cavalry units when viewed from an aerial perspective, so I have kept the same 8 figure frontage, but drawn them in a little tighter and the aesthetic is now better as well as giving a specific look for easy identification. Above - the General Fyrd are now easier to identify in their tighter formation. They are painted with drab earth colours. The plan is to give the wealthier Thegns some ‘richer’ colours, like blues on their cloaks, again leading to easier identification of unit type. Norman cavalry, which formed a significant part William’s force will be based as a single rank on 40mm deep bases, so that the line can be loosely placed to give an impression of movement and while I want these things to have an aesthetic presence on the battlefield, I don’t want to paint a ton of cavalry that going with two rank bases would require. The Kallistra basing system used in their rules has 4 horses on a 40mm x 20mm base and then the bases are set in 2 x 2 configuration, their mass looks superb, but I would have to paint twice as many cavalry, with each hex needing a full blister pack, so going with a single loose line on an 80 x 40mm base is a sort of half-way house between those two configurations. Light cavalry units will probably just use 5 models and be in a much looser configuration, so that they provide an instant contrast to their heavier bretheren. Archers and missile troops are the exception to using big bases. They will continue to be based on the supplied 40mm x 20mm bases, but I will only use one base per hex (hooray a saving on figures and painting). The reason is that in my boardgame version of rules, when archers fire, if they roll a ‘1’ or a ‘2’ they are removed from play as being ‘out of arrows’ and so they generally get burned off early in the game, once that typical opening phase of archery in the battle concludes. There is a game option for them to return later in the game resupplied, if a lull is called, but I have been very keen to ensure that archers are limited to their missile role in the early part of the game and that they do not get drawn into the game as melee capable troops as the game opens up, which in my humble opinion they were not suited to or used in that way. In fact archers are the only units that cannot become disordered, they are removed from play instead, increasing the sense of vulnerability of these troops in close combat. Their single small basing just helps visually reinforce these attributes that will define their use and of course again provide ready identification. So, this change of heart in how to base has come early enough for me to rebase what I have already done, plus visually, the gamer will find it easier to identify the different types of troops on the table from their basing configuration - an additional bonus, or possibly even the best reason for doing this now that I think about it. Initial plans suggest my total figures shopping list will eventually run to 33 blisters. Leaders - William, Alan and Eutace as contingent leaders. Plus Bishop Odo and a base that represents the Papal Banner. Rules - I have been giving this a lot of thought, but since I already have a boardgame on the subject that works well (again in my humble opinion! ), then it makes sense to use that game engine, or at least parts of it as a starting point. 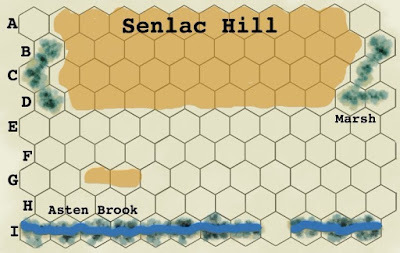 There are some difficulties with this, the battle frontages in the boardgame are two times longer (in terms of hexes) than will be used here and so this will cause some scale considerations (metres per hex) and the reduced number of units will need a re-think on how the morale / casualty system, with its Break Levels, can work. Also, the mapped game, because it has more hex locations, can throw up a lot of interesting local situations, so the player can be winning at one part of the map and about to collapse in another part. This is harder to achieve on a 12 hex frontage. I may start to work on a sub-system that is less 1066 specific, so that the set can be used for a wider selection of pre-gunpowder armies. Note Kallistra do their own free medieval rules (a download from their website) which of course are intended for using with hexes, though these use the basing system that comes with the blisters. These may ultimately still be the better rules for me to use, I would just need to mark casualties as the system relies on base removal. Army Collapse - The morale rules in my own Hastings system track casualties by the unit class. Each time a unit is lost, adjacent units take a morale test based on their class type, which gets harder to pass as casualties in their morale group rise. So for example if the break level for Housecarls is set at 10 for the scenario, the morale test taken after each Housecarl loss is a D6 plus the number of Housecarl units already lost, if that number exceeds 10, then then the testing unit(s) rout. Initially units will rout in dribs and drabs on unlucky die rolls, but as the battle grinds on and casualties increase, there is a greater chance of rout, until larger swathes of a force will rout at the same time, leading to the eventual breakdown of an entire army as large gaps appear. In the boardgame system, rout means rout, so those units are very unlikely to return to fighting status, but for Victory Points, do not count as fully lost until they leave the game, that can matter in the final turns. Because each category of contingent takes morale tests as a group type, the Norman player will need to be able to identify each base as belonging to one of the three nationalities in the Norman army. This is just an admin issue and there are several ways of showing it. Well that’s it for now. I am presently (slowly) painting armies and in the next update, I will take a closer look at Orders-of-Battle and how the rules are developing. Revolution Games - publishers of my Invasion 1066: The Battle of Hastings game. A replay of the Hastings board game. Where exactly was this battle fought? Interesting insight into your thoughtful planning process. I really like the look of your new, 80mm, three rank BMUs. To me, that's a winner. Looking forward to following your progress as you march toward completion. I expect to learn about the history and battle along the way as a bonus to seeing your armies grow. Thanks Jonathan, the nice visual from your own inclination to the larger single base has in no small part influenced my choice. So-much-so that I am considering (again!) doing something similar with my ACW collection. As always an excellent post Norm. Looking forward to more updates on this project. Thanks Steve, I am hoping that this one is going to be a bit more than a slow burner. Wow, this will be a thing of beauty! Good luck with it all, Norm. Aaron, I have an idea in my minds eye as to how this should look and just hope the reality is close. This is a fascinating insight into all aspects of designing a game, and it will be interesting to see how it eventually plays out. I remember that Time Team programme and thought the new alignment on Senlac hill looked persuasive, but, as you say, a reconstruction just needs to represent the features as you have them regardless of the specific location. The Time Team Programme in many respects did no more than cause controversy, there needs some hard artefact evidence to come out of the ground to help move the argument one way or the other and unfortunately neither site has done that, though in truth, very little of that sort of work has been done, outside of test pits. I love these type of posts that really allow us to see into the why and what is happening as you go on your journey. Good luck with the speed painting, the extra focus on the game this year and working on the rules (possibly the most time of it all). I will continue to follow with interest. Thanks Shaun, I am hoping that the gradual reveal of this project will make for some interesting posts that will no doubt reflect my own discoveries along the way, as there are things that are still uncertain to me. Great project...and I love this marsh , can't wait to see your collection of marshy ground! Thanks Phil, this was one of a pair of nice resins that just happened to make up rather nicely. My usual marsh hexes are disappointingly plain - perhaps I should work on them a little more before the big day. Very interesting read of Hastings, scenario design, and basing. Good luck on your project. I too need more Norman infantry for my Hastings but that’s way on the back burner so I’ll have to watch yours and live vicariously! Thanks Stew, I am not a painter by inclination, so that side of things is always something of a task - so I am grateful of the amount of chain mail that most of my Norman infantry are wearing. Really enjoyed this Norm and will follow with interest. Hexes, there the future!! Thanks Dave ... indeed they are! Good luck with this project and I will follow your progress with interest. The figures and basing look very nice. Thanks Peter, Jonathan's and your own basing have helped with the basing decision. Hastings is yet another battle in my 'to do' list but goodness knows when I will get around to it. A great write up here Norm. Looking forward to see how this develops through the year and of course the final 'dust up'. Thanks Michal, I hope to have a goodly amount to share on this is 2018. Thanks for following, follower support is hugely appreciated. Great article as always, Norm--makes me want to get my own Hastings project back up and running. I'm especially interested in how you adapt your board game for this, as I was planning on doing the same thing. Thanks Chris, for Franco-Flems, they are quite Norman-like in many respects because they can be classed as Heavy Infanty and Heavy cavalry. The Bretons on the other hand were noted for their light troops and their cavalry are thought to be more used to the tactic of feigning than the others. for the Bretons, I would keep a unit of heavy cav to represent the nobles and perhaps a unit of heavy infantry, the rest should be lights, so models can be drawn from unarmoured spear / javalin models with fewer figures to a base. In 20mm plastics selections from Viking levy or Anglo-Saxon Fyrd might work for infantry., not sure about cavalry, but anything unarmoured, with javelins is going in the right direction. I think Stretlets are doing quite a bit in 1066 20mm.